Vanity numbers are telephone numbers that are especially selected to convey a message in the digits of the telephone number themselves, or selected to be easy to remember. For example, 1800-200-5777 would be a vanity number selected for use because it’s easy to remember. A vanity toll free number would be any vanity number that is toll free, as is the example above. Vanity numbers can be selected to spell out a company name or a businesses benefit, like 1800-00-ZIFFY. The are endless benefits of having Vanity numbers. 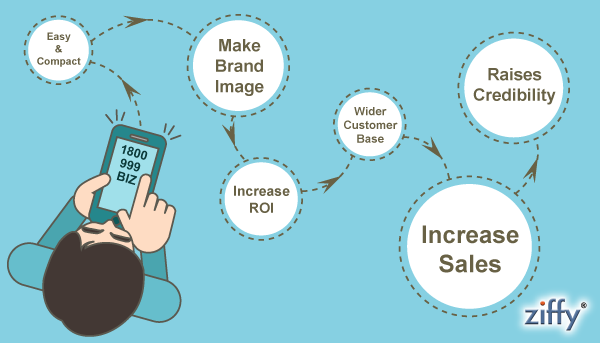 It goes beyond just brand recognition and credibility; toll free numbers can also increase your sales and ROI. Vanity numbers are very easy to remember. With a vanity number such as 1-800-800-BIKE or 1-800-800-CITY, the impression left is that your business is an easy-to-reach, easy-to-deal-with, consumer-oriented business. Toll-free vanity numbers are truly an affordable way to stand apart from the crowd. The eye-catching quality of a branded vanity number. People are more likely to call you, it can generate more sales and it can be a really powerful marketing tool for your business. Being easy to remember, the vanity numbers help increase brand name with word of mouth, as it is easy for customers to tell about your business and product to all prospective customers as the phone number which is an identity of your business is so easy to remember. . Vanity number helps promote your business as it brings credibility because of which customers are assured about the product and service your business offers. These numbers give an impression that your business is larger than what it actually is after all, you are actually paying for your customers’ calls and you have the resources to handle a large volume of calls. This in turn, gives you an air of credibility and customers are more willing to believe in what your ad says. A vanity number can help a business with both branding and getting a better response from advertising. Having a vanity 800 number also increases your credibility, especially if the number is strongly associated with your brand. Vanity 800 numbers do increase your marketing ROI. Vanity number plays a big role in increasing referral marketing for your business. Vanity numbers are an easy way to spread word-of-mouth and upsurge repeat customers. This is possible because using vanity number, customers can remember how to reach you for repeated orders, or to learn more about your services. And because vanity numbers are easy to remember your customers can tell others about how to reach you for the product or service you render. The larger advantage this provides companies is the competitive edge it provides any organization. When included effectively into a business’ phone system, an innovative form of communication with possible buyers is formed. That makes the likeliness of enquiries translating into revenue transactions, higher. Not surprising then that there are many organizations which maximize this on their advantage. A clever way to do that is through the use of vanity numbers. A vanity toll-free number gives you a chance to say something more about your business that your ads may not have touched upon. On the other hand, it may also act as another medium for you to reiterate your business’ USP, by probably using a catchword or a phrase that you have been lacing your ads with. This then creates a global brand identity and brings together all the different ads under the same ambit. With vanity toll-free numbers thus proven to increase the ROI for your business, it is not surprising that business owners and marketing professionals are increasingly using them to add a zing to their promotional efforts. Using vanity numbers really benefits for company or specific organization.It’s one of the technique for marketing.